One thing i noticed though is when you click to "See [category] results" (say, Video), it actually refreshes the whole page again. If they could make that process almost seamless like with the expanding, then it would be really really awesome! I like the feedback thing as well, that could really make the search index better, BUT it does mean it can artificially increase the importance of results over further searches which COULD have more information. 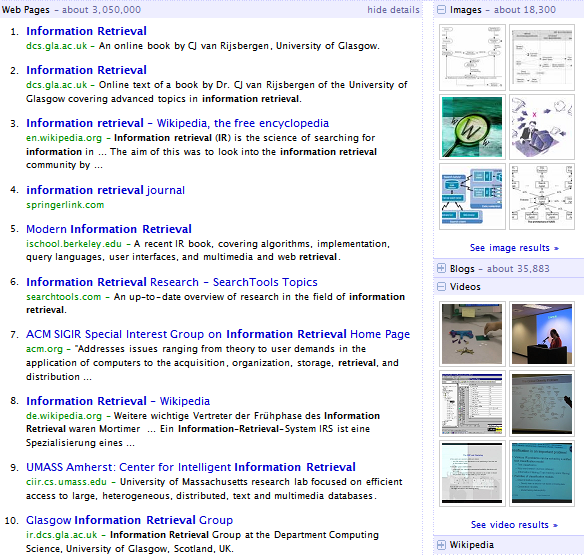 SearchMash is very similar to the old A9 interface, is it not? I wonder if it is Udi Manber (former CEO of A9, now at Google) who is behind SearchMash. Can anybody think of a reason that this isn't at Google Labs? It was supposed to be a secret. As you can see, there's no Google branding there, so people should evaluate their experiments without knowing it's a Google site. Of course, now we know that. But they may have many testers that don't.